What Are the Best Jewish Dating Sites Online? Looking for the best Jewish dating sites? If you've ever wondered which dating sites are best suited to meeting Jewish singles, we've got you covered! OnlineDater.org regularly reviews the best Jewish dating sites online, showing you who provides the best results, as well as what features set those sites apart. For example, did you know that JDate has more Jewish singles than almost any other Jewish dating site on the web? JewishFriendFinder, on the other hand, is smaller but caters exclusively to the Jewish dating niche. Finally, Jewish Mingle is great because of its almost 50/50 split between Jewish men and Jewish women! We review the highest quality and most popular Jewish dating sites, giving you the greatest chance of finding the exact person you're looking for. Best of all, many of the dating sites listed here are FREE and extremely easy to sign up with, so you can be connecting with other Jewish singles literally within minutes. JDate.com is the leading dating site for Jewish singles, featuring many highly eligible college-educated Jewish men and women. There's more than 300,000 members in the US alone. Video chat allows singles to meet face-to-face online. 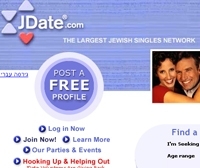 Definitely the top site we've found for Jewish dating. Many members of JDate.com are concentrated in large metro areas, but there's still tons of members all over the country. You'll find about an equal male-to-female ratio. Jewish Friend Finder features a ton of active chat rooms, forums, user blogs and more. The huge number of ways to contact other members creates an especially vibrant sense of community for Jewish singles looking for a match. Jewish Mingle offers multiple ways to get in touch with other Jewish singles, including email, instant messaging and live chat rooms, as well as sending "smiles" and predefined messages via a variety of E-cards. It's also easy to get quickly started without filling out lots of forms. One of the more affordable Jewish dating sites, Jewish Mingle offers the full range of features at a highly competitive price. You'll find personality tests to help match you to the person most compatible with you, plus an easy to use and intuitive interface. Online for more than 10 years and exclusively Jewish, Jewish Match has a thriving membership and a huge number of Jewish Singles. This alone practically guarantees you'll meet someone compatible with you. Jewish Match has a comprehensive registration process, which takes bit longer to fill out than most dating sites, but makes it more likely active members are committed to finding a compatible relationship.